Wordshark has been producing learning games for reading and spelling for over 20 years, revising and updating continually to reflect best educational practice. Wordshark has remained a small company, staying within its area of expertise. 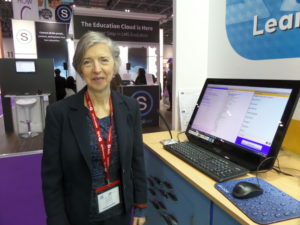 Ruth Savery, an experienced SEN teacher and mother of 2 dyslexic children started co-writing Wordshark in the early nineties with Roger Burton, an accomplished computer programmer. Wordshark and Numbershark were ground-breaking in their approach to teaching children with SEN using computers, developed in the days before PCs had high-powered graphics! Roger programmed Wordshark from a bedroom living off savings while Ruth worked as the Education director part time whilst teaching as a SENCO in a North London primary school. In addition to her teaching role, she lead the way with whole school spelling competitions, ‘introduction to Secondary School’ days, managing the ‘worry wipers’ (responsible students helping out fellow students), and resolving tricky bullying issues in school. Ruth’s background/experience in education and social work, make her highly experienced and knowledgeable on many subjects including SEN. She shares her time between the ongoing development of Wordshark, and environmental/community charity work. To develop innovative, stimulating and flexible computer programs which assist the memory in acquiring literacy and numeracy: both with and without specialist teaching support. Thanks to members of the BDA who gave advice and comment in the early development of Wordshark. White Space is also grateful to the late Dr Bevé Hornsby for allowing certain word lists to be based on those of Alpha to Omega. Finally, the program owes much to the many children, parents, educational psychologists and teachers who have provided suggestions and ideas for improving the programs. White Space is a member of BESA (the British Educational Suppliers Association) and subscribes to their code of practice.